That Was It . . .
With the weather cooperating this morning I went outside and top off the rig’s engine oil with 3 gallons of Shell Rotella 15W-40. 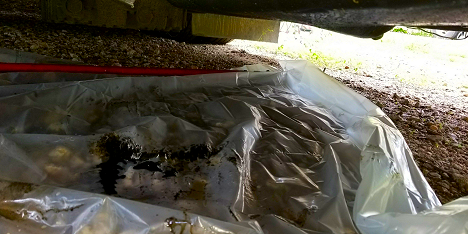 Then I laid down a big sheet of plastic sheeting under the engine to catch any leakage so I could visually confirm the leak, and also protect the gravel. Back inside, I raised the bed cover and then cranked up the engine and let it run at high idle (950 rpm) for about 30 minutes. Then I shut it down and went outside to take a look. And here’s what I found. About 1/2 cup in 30 minutes. So next I crawled underneath to take a look, and found this. 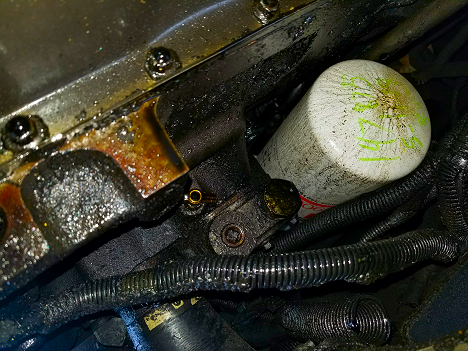 It’s definitely coming down from the filter, so I put in a call to RV Mobile Lube to come out and take a look. It could be a defective filter, or a bad installation. But I’ll them figure it out. Later, about 1:30, Jan and I headed out, with our first stop at the nearby Los Ramirez Mexican Restaurant for lunch. We first ate here about 10 days ago, and were amazed at how good the food was, and how CHEAP it was. And ya’ll know how much I like CHEAP! And CHEAP and GOOD is even better. And since it was so good the first time we did it exactly the same as last time. 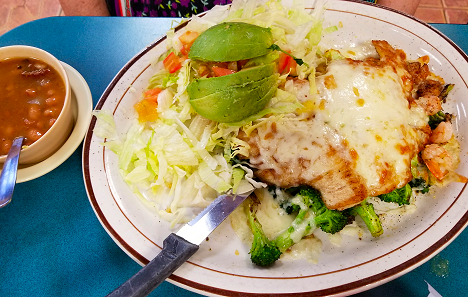 Jan got the Pechuga Rellena with a Grilled Chicken Breast stuffed with Grilled Shrimp and Broccoli on a bed of rice with Charro Beans and half a sliced Avocado. All this for only $7.99. And I went the same way again too, with the Beef Fajita Taco Salad. 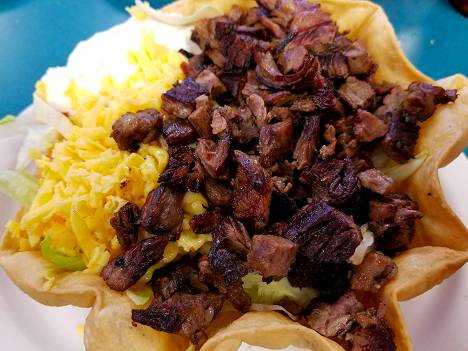 Really, really good, and only $5.59 on the Lunch menu. Like I said CHEAP and GOOD. Our next stop was at a Capital One branch to get some papers notarized, and check out some account details. Then we made a drop-off at the Salvation Army and an Amazon package pick-up at my client’s. And after a P.O. stop we got home about 4:30. Another busy day.